When oil, gas, and coal are burned, the carbon they contain is oxidized to carbon dioxide (CO2), the main greenhouse gas. In effect, the combustion of fossil fuels releases ancient carbon (carbon that has been buried within the earth for thousands of years), thereby increasing the atmospheric concentration of carbon dioxide (CO2). In comparison, wood combustion can be considered carbon neutral because trees absorb CO2 as they grow. This process is called carbon sequestration. Approximately one ton of carbon is sequestered for each cubic meter of wood. When trees mature, die, fall in the forest and decompose, the same amount of carbon is emitted as would be released if they were burned for heat. 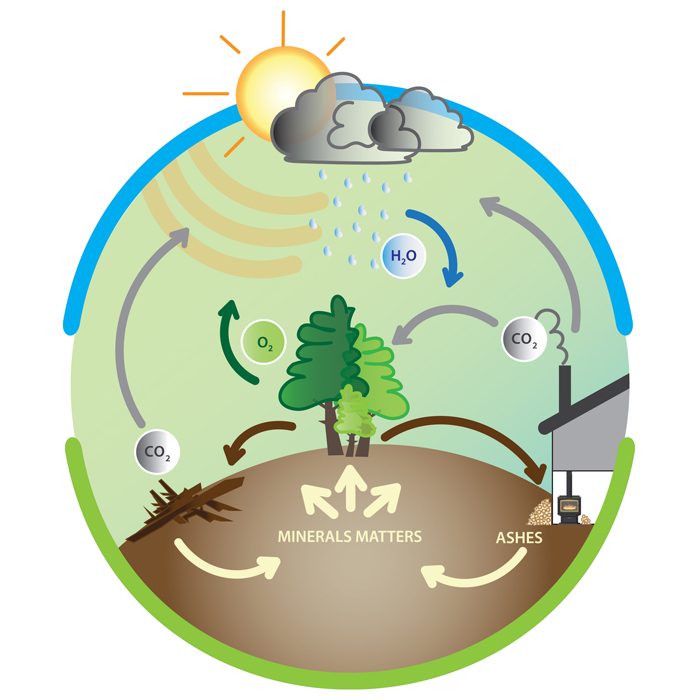 This cycle can be repeated forever without increasing atmospheric carbon. A healthy forest is not a museum, but a living community of plants and animals. When trees are used for energy, a part of the forests carbon "bank" is diverted from the natural decay and forest cycle into our homes to heat them. The combustion of wood produces small particles that are called PM2.5. Those particles are 30 times smaller than a human hair. They can aggravate certain lung and heart diseases and have been linked with health problems such as asthma. Sources of PM2.5 include combustion under various forms, such as the one used for cars and trucks, wood heating, as well are other industrial processes. While it is true that old technology like open fireplaces and simple heaters could not burn the wood completely, the new generation of wood-burning appliances are designed to burn particles. They produce almost no visible smoke. The wood-heating industry has evolved. The vast majority of appliances sold on the market now meet the particles emissions limits set by the US Environmental Protection Agency as well as the Canadian standard CSA B415.1-10 For example, the Environmental Protection Agency, better known as EPA, limits emissions of certified wood heating appliances to no more than 4.5 grams per hour. In comparison, older conventional wood stoves average 40 grams per hour. Numerous countries, provinces and municipalities, have adopted laws that regulate the sale of wood-heating appliances that do not meet the latest standards in terms of particles emissions. Among them, we can name the United States, Australia, New Zealand, as well as numerous countries that are part of the European Union. In Canada, British Columbia, Quebec, Nova Scotia, and Newfoundland have also introduced laws regulating the sale of wood-heating appliances. Wood, when burned in an appliance that has been tested to the EPA or CSA B415.1-10 standards, emits up to 80% less particles. It is a clean, renewable energy source. Furthermore, the reduction in fuelwood consumption reaches up to 30% when advanced wood combustion systems are used. This is because certified wood stoves and fireplaces are 60% to 80% efficient, compared with 40% to 60% for conventional units. As for appliances burning wood pellets, they have amongst the lowest particulate emissions of all solid-fuel burning appliances. They are manufactured from waste products and other renewable resources right here in North America. They represent a huge source of heating fuel from material that would otherwise be sent to landfills. All Century Heating EPA wood appliances have a secondary air source. Heated air flows, which are circulated through perforated channels located under the firebox baffle, allow for a more complete combustion of particulates before they are released into the atmosphere. You burn less wood and help the environment. The Hearth, Patio, & Barbecue Association (HPBA) is an international trade association that represents and promotes the interests of the hearth products industry in North America. HPBAC is the Canadian affiliate of HPBA (see link above). This web site provides helpful hints on how to use your wood heater in an efficient manner, in accordance with current Canadian security standards. This comprehensive web site deals with all aspects of residential wood heating, from environmental issues to technical advice. This section of the EPA web site contains valuable informations on EPA burning as well as installation and proper use of your wood stove. This web site of the Pellet Fuel Institute (PFI) educates consumers about the convenience and practicality of using wood pellet fuel in both residential and commercial applications. This web site of the Wood Energy Technology Transfer Inc. (WETT Inc.) promotes the safe and effective use of wood burning systems in Canada through professional training and education. This site presents a complete guide to residential wood heating. This web site of the Ontario Woodlot Association promotes sustainable forestry practices in private forests to ensure the viability of these forests for future generations. It also contains very interesting discussion papers and studies regarding woodburning. 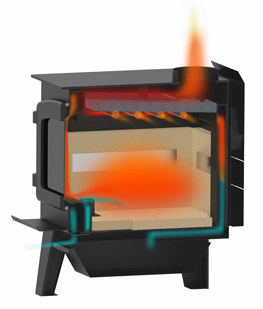 This web site provides you with information so that you can find the best multi fuel stove for your household and shows how wood and other fuels, burned in a modern stove, offer an immediate, prac­tical, low-cost method of full-time home heating for any­one.